Outside of 9/11, one of the most visually horrific memories of the television age occurred on November 22, 1963 – the day President John F. Kennedy was assassinated as his motorcade winded through Dallas, Texas. Of course, the famous footage that was shot by Abraham Zapruder wasn’t shown to the public until 1975, but the impact of the visuals captured by Zapruder have been sewn into the public’s memory ever since. Like anything of this nature, once you watch it you can’t “unwatch” it and future generations, ever more distant from the Presidency of John F. Kennedy, will still surely come to remember his fate much the same way we all have. The view down Elm Street where Kennedy was shot, headed toward the underpass. 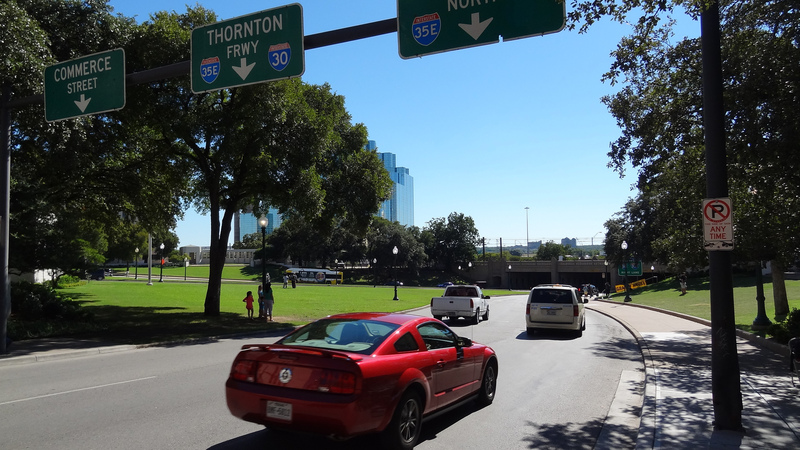 Nearly fifty years have passed since that fateful day in American history and yet tourists pour onto Elm Street in Dallas to take in the moment themselves. Sign me up as one of them. I finally made it to Dallas “officially” this past weekend. I actually flew in Friday night, had BBQ in the morning (Mike Anderson’s is the best, look ’em up) before heading out to Nacogdoches with Breeah (I was covering that night’s Montana State-Stephen F. Austin football tilt in East Texas). Our flight out of Dallas wasn’t until 8 p.m. on Sunday night and with a few hours to burn after the return drive from Nacogdoches (pronounced “Nag-uh-doe-shus” – at least by the PA announcer at the game) we decided we’d do our civic duty and visit The Sixth Floor Museum at the old Texas School Book Depository building. To my surprise, the museum is a rather recent development, opening in 1989 (a little over 25 years after the assassination). The building belongs to Dallas County, which uses it for administrative offices occupying the first five floors. Patrons are sent around back to purchase a ticket (I recommended buying your ticket in the gift shop and cafe, which is located in the Dal-Tex building across the street. You’ll avoid the line. 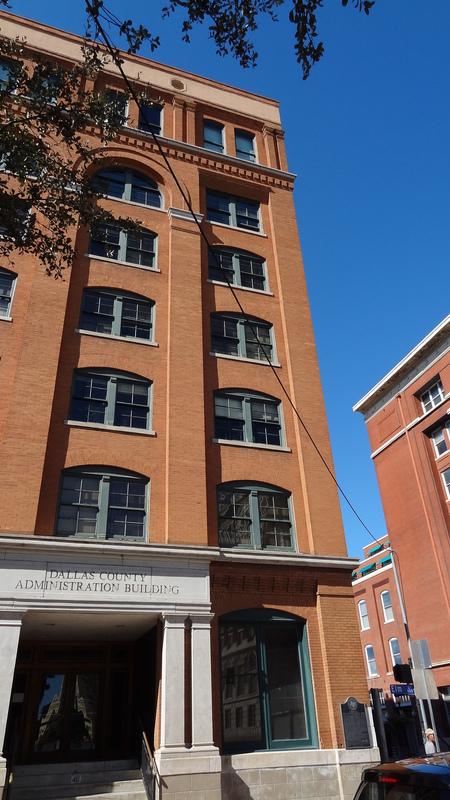 Fun fact: The Dal-Tex building housed Zapruder’s office). Once you have your ticket you receive a headphone set and proceed to the elevator which takes you right up to the sixth floor. There you start your tour. 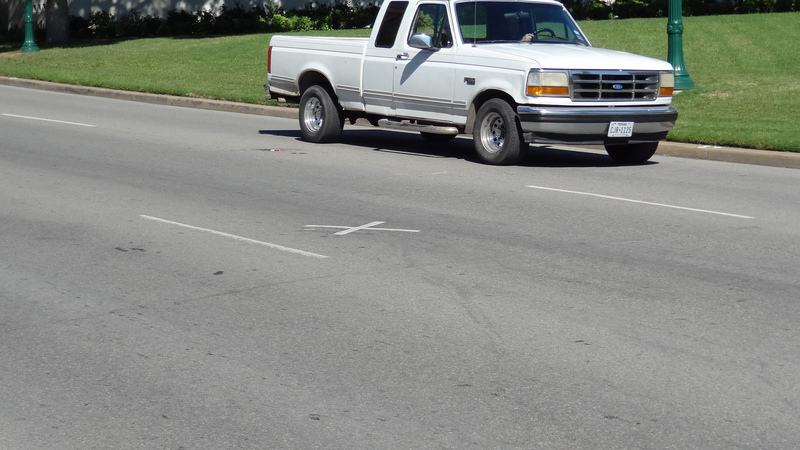 This “x” marks the spot of the second, fateful shot that killed Kennedy instantly. The tour lasts as long as you want it to. Listening to every part of the audio tour takes quite a bit of time (I’d guess about two hours). The parts of the floor where Lee Harvey Oswald allegedly set up his perch are encased in glass as is the opposite corner where the gun was found. The storage boxes were recreated to give the feel of exactly how everything was setup that day. Unfortunately, no pictures are allowed in the museum, so I can’t share any snaps of those (but you can find them online). Breeah and I listened to a majority of the audio and read all the displays, our entire visit (including wandering around outside) took some two-and-a-half hours. Critics of the museum say it follows the Warren Commission reports to a “T”, not granting much credence to any alternative “conspiracies”. Well, it is the “Sixth Floor” museum, so what do you expect? In fairness, they end the tour with various conspiracy ideas and mention how the whole investigative process has captured the public’s attention for some time. 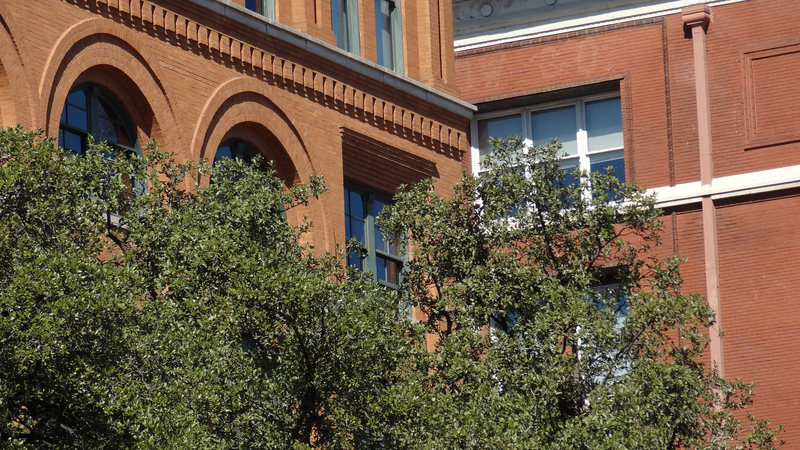 Oswald’s perch was at the sixth floor corner window. The gallery of famous (and sometimes humorous and irreverent) Presidency-related photos adorns the seventh floor walls and is a fun little walk through that doesn’t take too much time. 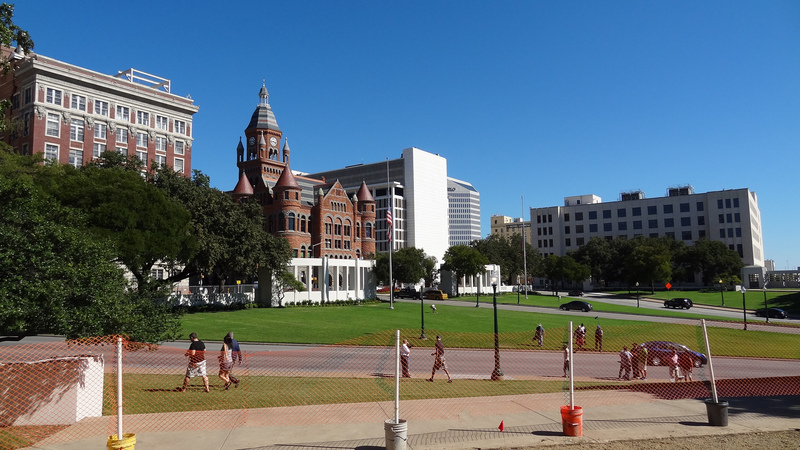 After that we headed outside to take in Dealey Plaza for ourselves – walking alongside the same part of Elm Street where the President was slain (there are x’s painted in the road marking when the President was hit). 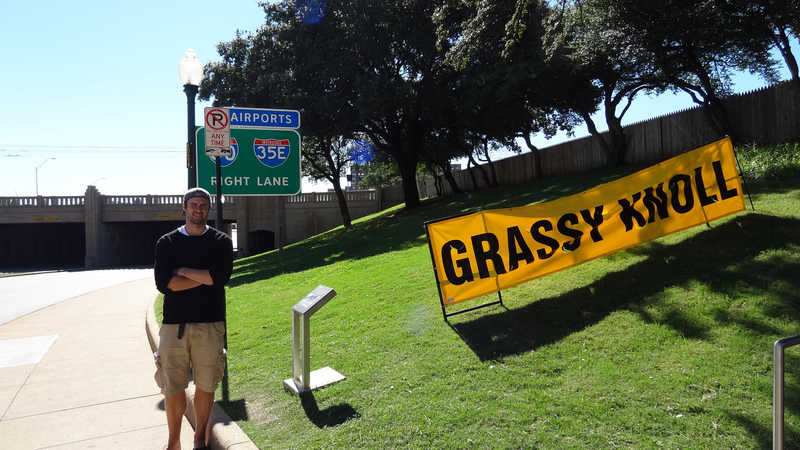 There is a somewhat audacious banner sign marking the “grassy knoll”, a spot further down where many theorists suspect to be the location of an additional gunman. The sign is actually used to promote a conspiracy-themed book sale that is stationed on the Bryan pergola, abutting the knoll. I felt a tad guilty taking in this spot as a tourist, a spot where a great man was killed, a loving wife received the ultimate shock of her life and bystanders, there to celebrate the American spirit, witnessed a life taken. A visitor here can’t help but be reminded that life is finite no matter how long or great one’s life is. But we’re also reminded that, despite the gruesome end to a great human life, JFK’s story is important not because of the way he died, but the way he lived.